105 stories. 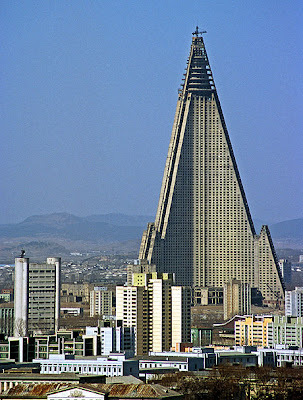 The Ryugyong Hotel in Pyongyang, North Korea. The 22nd largest skyscraper in the world. And empty. From Esquire Magazine: In 1987, Baikdoosan Architects and Engineers put its first shovel into the ground and more than twenty years later, after North Korea poured more than two percent of its gross domestic product to building this monster, the hotel remains unoccupied, unopened, and unfinished. Construction on the “Hotel of Doom” stopped in 1992 (rumors maintain that North Korea ran out of money, or that the building was engineered improperly and can never be occupied) and has never started back up. At least Ceaucescu’s Palace was usable. Yamoussoukro – West Africa’s capital of ghosts, was mostly not. And what will Dubai be in one hundred years?